Our highest mission is your experience and we guarantee every service to exceed your expectations. Hair Babe Studio combines boutique luxury with expert artistry to create a salon experience that is elegant yet inviting, indulgent yet completely relaxed. You can be assured that you are receiving personal treatments with results as individual as you when you visit Hair Babe Studio. One of Asheville's most sought after stylists, Monica opened Hair Babe Studio in Asheville to redefine the boutique salon experience for her clientele. Monica has elevated hair color and hair styling into an art form through her impressive body of work, keen eye for detail, and ability to showcase one's natural assets. 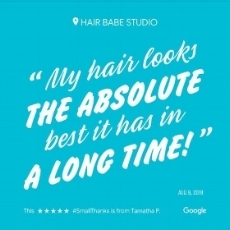 Monica's command for her craft and commitment to providing her very best, with innovative artistry and expert touch sets Hair Babe Studio apart.